OtoSome-Suzuki launches new MPV, Suzuki Solio in Japan. Offered in two types, namely Solio and Solio Bandit. Latest Suzuki Solio comes with a number of changes and additions to the latest features. Suzuki Solio uses a new lightweight platform, which has dimensions of 3.7 meters long, 1.6 meters wide and 1.7 meters high. Wheelbase also extended 30 mm to 2,515 mm. Fun, with a new platform, body weight was reduced to 100 kg. 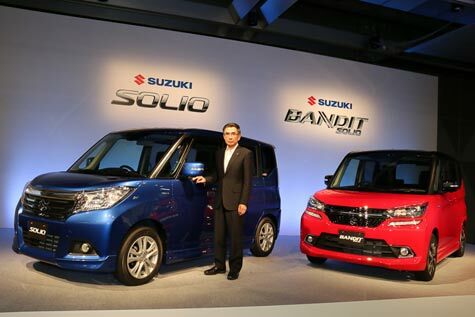 Suzuki Solio actually similar to Karimun Wagon R, only have the look more elegant and luxurious impression. His new grille with more chrome thick, lighting design, to bumpers are made of premium-style van. While Suzuki Solio Bandit, just added some accessories to the exterior and the interior, with the impression of more adventure. LED lights are also already embedded in this variant, including a 15-inch rim circumference. Entry into the cabin, we are presented with the multi-function steering wheel space, headroom higher, and a touch screen navigation system with integrated infotainment system in the form of a 7 inch screen. Machinery sector was also helped changed. It is said Suzuki, mini MPV is the first time using Mild Hybrid technology from Suzuki. Power sources come from K12C engine capacity of 1.2 liter Dual Jet capable of producing a power of 89.7 hp and torque of 118 nm. This engine paired with a CVT transmission. While the hybrid system gets integrated starter generator, lithium-ion battery, stop-start system and regenerative breaking system. The result is a fuel efficiency of 27.8 kpl claimed translucent when tested in Japan. Some safety features can be found in these new offerings such as Lane Departure Warning, dual camera brake support system, Emergency Stop Signal, ABS and ESP.